Enough time has passed since the hard freeze of last Tuesday morning’s early hours for me to assess damage to my plants. 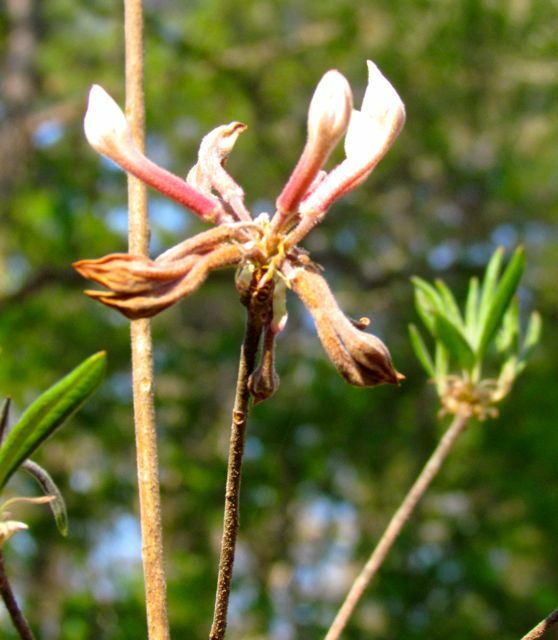 Three magnolias were dramatically impacted. 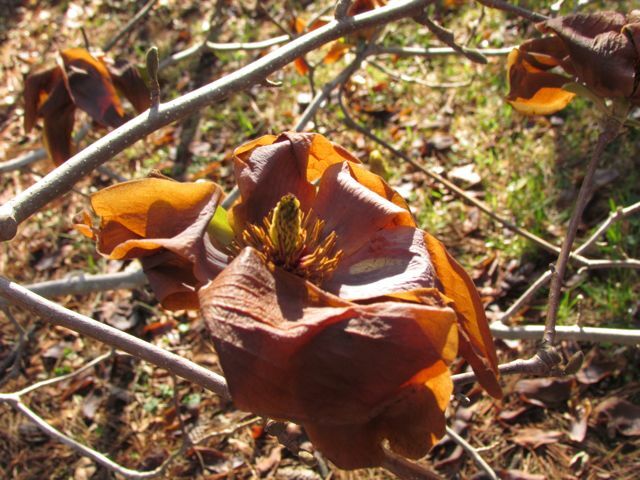 Magnolia ‘Butterflies’ lost its final few blossoms and some early emerging leaves to the cold. The good news is that Elizabeth’s leaves were still tightly closed within their buds, so as soon as the mushy brown flowers fall, it will look normal. Another of my magnolias that has not yet bloomed for me was just leafing out. Magnolia sprengeri ‘Diva’ has grown into a 12-foot tree – too tall for me to cover. This Chinese magnolia cultivar is supposed to have gorgeous pink blooms. 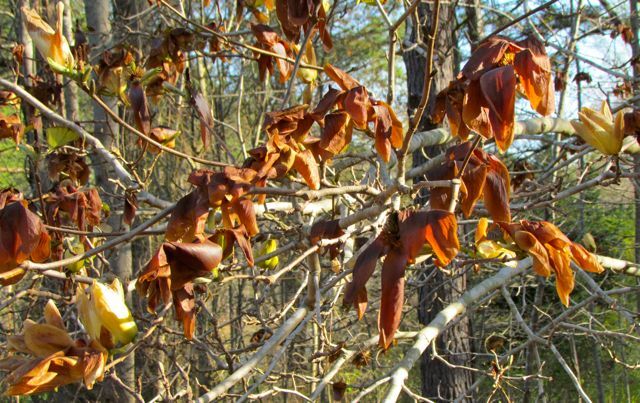 But now that its first flush of new leaves have been blackened by the freeze, it probably won’t have enough enthusiasm to generate flower buds for next spring either. Not all the flower buds look so damaged, so I will likely see some healthy pink blossoms. But the shrub won’t be the showstopper it should have been. A few additional trees and shrubs have damaged bits here and there, but I believe the newly leafed-out canopy trees all survived intact. All in all, the freeze could have been far more disastrous. It appears that we’ve dodged another black spring. I wish I could report similar good news regarding precipitation. Yes, we got some, but nearby areas got much more, as has been the heart-breaking trend for some months now. Our automated gauge only registered 0.87 while many others within 30 miles of here got an inch and a half or more. Our creek levels came up briefly, but have already receded. The biggest winner appears to be the lawn; we will be mowing this weekend for sure. I am grateful that the freeze didn’t hurt more tender vegetation, but I confess I am getting pretty cranky about the way the precipitation continues to detour around my thirsty yard. This entry was posted on April 2, 2011, 4:33 am and is filed under piedmont gardening. You can follow any responses to this entry through RSS 2.0. You can leave a response, or trackback from your own site.